In December, Marquette Transportation Co. took delivery of a new 2,000-hp Z-drive towboat from Master Marine, Inc., Bayou La Batre, Ala. 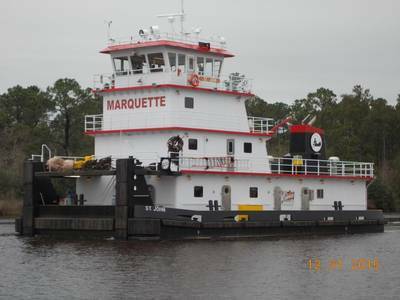 The 78'x 34’x11' St. John was designed by Entech & Associates, for Marquette’s Gulf-Inland division, based in Harahan, La. The steel-hulled St. John is powered by a pair of Thompson Power Systems Caterpillar C32 Tier 3 1,000-hp engines at 1,800 rpm connected to ZF Marine ZF AT 5111WM-FP Z-drives with 1,650 mm (65") 4-bladed propellers in nozzles. The package gives the boat a running speed of 10 knots with a loaded draft of 8’. For ship’s service power the towboat is outfitted with a pair of Kennedy Engine John Deere 4045AFM85 Tier 3 generator drive engines each driving an 80-kW Marathon Mariner generators. Cooling for all engines and z drives was provided by Eastpark Radiator Duraweld coolers. Doors and windows were provided by Dales Welding & Fabrication, LLC. Rubber bumper systems were provided by Schuyler Companies. The electronics was supplied by New World Electronics and Rio Marine supplied the alarms and monitoring systems. To secure barge tows, there’s a pair of Patterson 40-ton deck winches supplied by Donavan Marine. The St. John has tankage for 24,000 gallons of fuel; 6,550 gallons of potable water; and 17,560 gallons of ballast water.